Immuno-localization of PfSEP14 on synchronous P. falciparum cultures. Double immunofluorescence assay was performed on unfixed parasites with PfSEP14-specific rat immune serum (dilution 1:200), revealed with FITC-conjugated anti-rat IgG (green) and with anti-Pf332 monoclonal antibody Mab51-22, revealed with TRITC-conjugated anti-mouse IgG (red). Parasite nuclei are stained with DAPI. Bar represents 5mm. 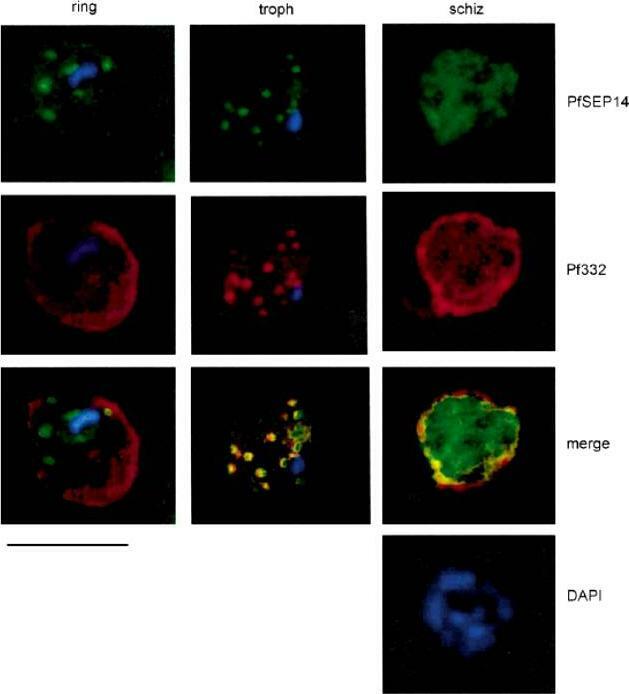 At the stage of ring the distribution of PfSEP14 did not co-localize with that obtained with Mab51-22 which, at this stage, cross reacts with RESA. A similar pattern of fluorescence for both antigens appeared instead in trophozoites, while at the schizont stage patterns were distinguishable, in that SEP14-associated fluorescence was diffuse within the parasitized cell and did not appear concentrated at the edges of the schizonts.Birago C, Albanesi V, Silvestrini F, Picci L, Pizzi E, Alano P, Pace T, Ponzi M. A gene-family encoding small exported proteins is conserved across Plasmodium genus. Mol Biochem Parasitol. 2003 126:209-18. Copyright Elsevier 2010.